The Cal Poly Dairy Products Technology Center was host to the 18th annual Dairy Ingredients Symposium, held this year on February 17th and 18th in Shell Beach, CA. The symposium is designed to present an overview and update on the latest trends and issues in the marketing, science, manufacturing technology and application of dairy ingredients, including whey-derived and milk-derived concentrates and powders. This year’s program attracted more than 130 registrants from five countries and 18 states. The California Dairy Research Foundation, National Dairy Council and U.S. 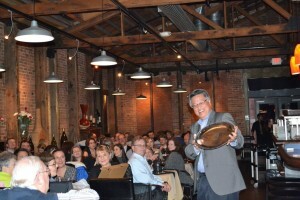 Dairy Export Council jointly held a dinner in honor of Tong to recognize his years of work and contributions to the dairy industry and science. He was instrumental in establishing the DPTC and in the education and training of the next generations of work force and scientists. Tong will be retiring this spring after nearly 30 years at the DPTC. Professor Phil Tong received an engraved silver platter in honor of his retirement this spring. Tong retires after nearly 30 years from the Dairy Products Technology Center at the California Polytechnic State University in San Luis Obispo, Ca. He plans to stay actively involved in the DPTC and the industry at large. Dr. Gonca Pasin, executive director of the California Dairy Research Foundation, gave special recognition to Tong for his successes: organizing and instructing over 100 short courses and symposia; mentoring 35 Masters students; publishing over 100 research and trade articles; giving more than 300 presentations in 10 countries; and teaching numerous undergraduate and graduate-level courses. He hopes to continue to support the DPTC, and also plans to consult directly with the dairy and food industry and related organizations. 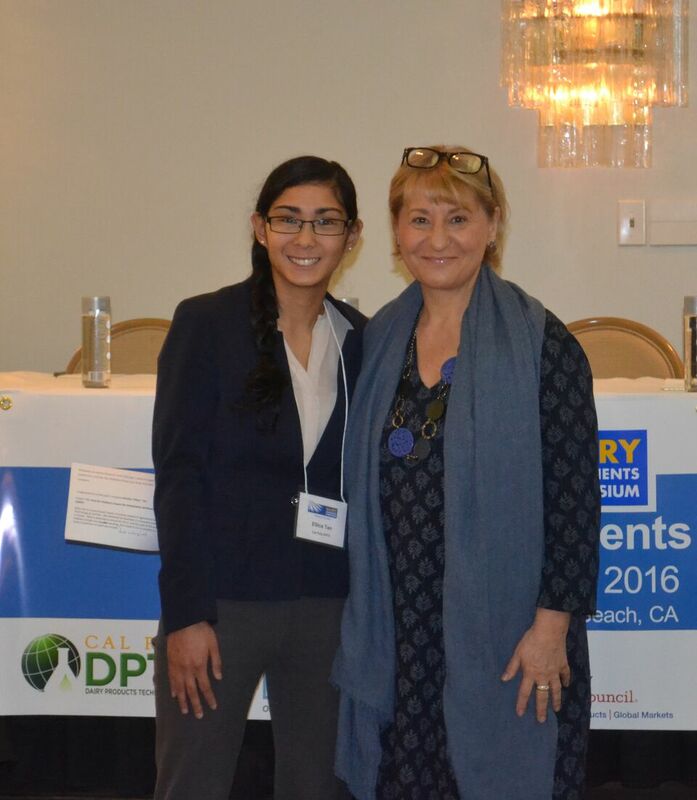 Dr. Gonca Pasin, right, of the California Dairy Research Foundation, presented the 2016 Student Travel Award to Kristina ‘Ellice’ Tan, left, for her winning poster presentation at the 18th annual Dairy Ingredients Symposium held this year in Shell Beach, Ca. In 2013 the California Dairy Research Foundation established the Student Travel Award through the Cal Poly Dairy Science Industry Outreach Program. The award is given annually to an undergraduate or graduate student to promote gaining the experience and exposure that comes from attending and presenting their work at the Dairy Ingredients Symposium. and Hadi Eshpari from The Kraft Heinz Company. How Do Chelators Impact the Rehydration Attributes of Skim Milk Powder (SMP)? Tan is a second-year Master of Science student in agriculture, focused in Dairy Products Technology at California Polytechnic State University. For more photos of the 2016 Dairy Ingredients Symposium, click here. Dairy protein-based ingredients are being used in a wide range of customized new products that appeal to millennials including novel snacks, protein-fortified beverages, “better for you” desserts, and meatless protein patties. Presenter: Donna Berry, Dairy and Foods Communications, Inc.
High protein dairy ingredients sensory and functional qualities are influenced by a wide range of factors, and these become more challenging as protein load increases. Presenter: MaryAnne Drake, SEDFRC, NC State Univ. Improving current raw milk hauling practices can improve total processed milk quality. Presenter: Lisbeth Goddik, Dairy Processing Extension Specialist, Oregon State Univ. Age-related hardening of protein nutrition bars can be reduced by making a three-component co-solvent system and using small molecules to mask hydrophobic protein-protein interactions. Presenter: Don McMahon, Western Dairy Center, Utah State Univ. Ultrasound spectroscopy and focused beam reflectance measurement provide more detailed information about dairy powder dissolution properties. Presenter: Jay Amancharla, Animal Sciences and Industry, Kansas State Univ. This year’s symposium was sponsored by the California Dairy Research Foundation, National Dairy Council, U.S. Dairy Export Council, Tetra-Pak, and GEA Group.